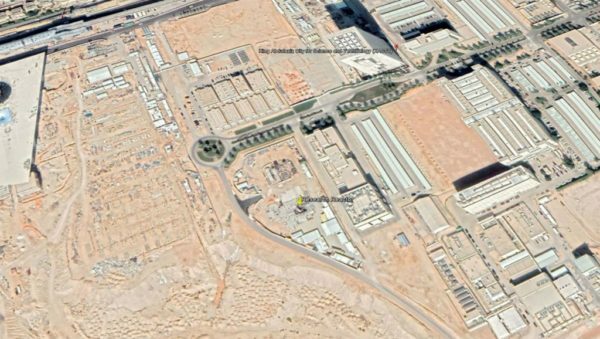 Google Earth | The location of Saudi Arabia’s first nuclear reactor, currently under construction in the outskirts of Riyadh. Saudi leaders say they need nuclear energy to wean their country of its dependence on fossil fuels. But construction of a first reactor is sparking fears about the Gulf state’s quest for nuclear power in a volatile region. Satellite images of a nuclear reactor under construction on the outskirts of the capital, Riyadh, have reignited fears of an escalation in the tussle for regional hegemony pitting the Saudi kingdom against Iran. In a bid to allay such concerns, the head of the UN nuclear watchdog, the Vienna-based International Atomic Energy Agency (IAEA), has asked Saudi authorities to agree to additional safeguards verifying that the nuclear technology is used for peaceful applications. The Saudi reactor is within months of being completed, according to Robert Kelley, a former director of nuclear inspections at the IAEA, who identified the images first published by Bloomberg last week. “I would guess they could have it all done, with the roof in place and the electricity turned on, within a year,” Kelley told the Guardian newspaper. When that happens, Saudi Arabia’s first reactor will not instantly propel Riyadh to the rank of major nuclear power, experts have cautioned. “It’s a small reactor that is essentially designed for research and development,” said Laura Rockwood, head of the Vienna Center for Disarmament and Non-Proliferation, in an interview with FRANCE 24. The main purpose of such installations is to train scientists and carry out medical research in such fields as cancer treatment, added Rockwood, who worked at the IAEA’s legal affairs office before joining the VCDNP. Saudi Arabia’s plans to build such a site have been known since 2015, when it signed an agreement with INVAP, the Argentinian state-backed nuclear company that is now building the reactor in the outskirts of Riyadh. Still, the satellite images mean the country’s “desire to have its own nuclear plants is now proven”, said Rockwood. Having spent over a decade looking for partners willing to share their nuclear technologies and know-how, Saudi Arabia now hopes to start building its first two nuclear power reactors in 2020, according to the US-based Institute for Science and International Security (ISIS). US, Russian, South Korean, Chinese firms have been short-listed by Riyadh and are hoping to clinch the multi-billion-dollar contracts. With the lucrative tenders in mind, President Donald Trump’s administration has quietly approved six authorisations for US companies to do nuclear work in Saudi Arabia, the Daily Beast reported last month, in a move that has prompted sharp criticism in the US. Critics of Washington’s decision fear it may ultimately lead to the Saudis developing a nuclear weapon with the help of US technology. They point to Crown Prince Mohammed Bin Salman’s warning in March last year that the kingdom would develop nuclear arms if Iran did so too. That was “the only time Saudi Arabia publically expressed an interest in nuclear military capabilities”, cautioned Rockwood. Riyadh has otherwise always stressed that its nuclear plans are strictly civilian. The idea is to broaden the Gulf state’s energy mix in order to “to get away from the near-complete reliance on hydrocarbon resources to produce electricity”, wrote Ali Ahmad, an expert in Middle Eastern energy policy at the University of Beirut, in a research paper on the Saudi nuclear programme. “Such reliance is seen to lead to the depletion of national oil and gas reserves but is also perceived to have an opportunity cost associated with foregone export revenues,” Ahmad added. Saudi Arabia has also been a signatory to the Non-Proliferation Treaty (NPT) since 1988, albeit with an important caveat: it later exempted itself from regular inspections by signing an additional protocol, known as a “Small Quantities Protocol (SQP)”, in 2005. The IAEA has since amended the SQP to add extra safeguards, but Riyadh has refused to adopt the new rules. “Saudi Arabia was the last country allowed to sign the old SQP. And they never agreed to adjust or rescind it,” said Rockwood, describing this as a “surprising choice, since with such neighbours [Iran] one could have expected Riyadh to opt for maximum transparency”. She added: “The Saudis should rescind their SQP and bring into force an additional protocol […] that offers greater safeguards.